Brearleyite (IMA 2010-062, Ca12Al14O32Cl2) is Cl-bearing manyenite, occurring as fine-grained aggregates along with hercynite, gehlenite and perovskite in an uncommon krotite (CaAl2O4) -dominant refractory inclusion from the Northweat Africa 1934 CV3 carbonaceous chondrite. It is the first occurrence of Ca12Al14O32Cl2 in a meteorite, identified by FE-SEM, TEM-SAED, micro-Raman and EMPA. It is potentially an extraterrestrial alteration mineral. The mean chemical composition determined by electron microprobe analysis of this brearleyite is (wt%) Al2O3 48.48, CaO 45.73, Cl 5.12, FeO 0.80, Na2O 0.12, TiO2, 0.03, O -1.16, sum 99.12. Its empirical formula calculated on the basis of 34 O+Cl atoms is (Ca11.91Na0.06)∑11.97(Al13.89Fe0.16Ti0.01)∑14.06O31.89Cl2.11. Rietveld refinement of an integrated TEM-SAED ring pattern from a FIB section revealed that brearleyite is cubic, I4bar3d; a = 11.9794(5) Å, V = 1719.12(22) Å3 and Z = 2. It has a framework structure in which AlO4 (aluminate) tetrahedra share corners to form eight-membered rings. Within this framework, the Cl atom is located at a special position (3/8,0,1/4) with 0.374 occupancy and Ca is disordered on two partially occupied sites. It has a dark green color and a calculated density of 2.797 g/cm3. 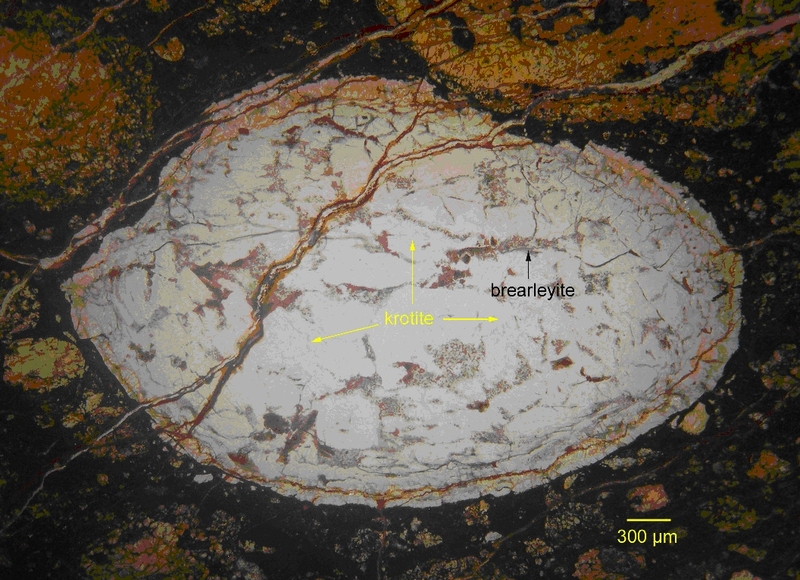 Brearleyite is not only a new meteoritic Ca-, Al-phase, but also a new Cl-rich phase in a primitive meteorite. It likely formed by reaction of krotite and Cl-bearing hot gas or fluids. A reflected light photograph of the krotite-dominant CAI containing brearleyite. 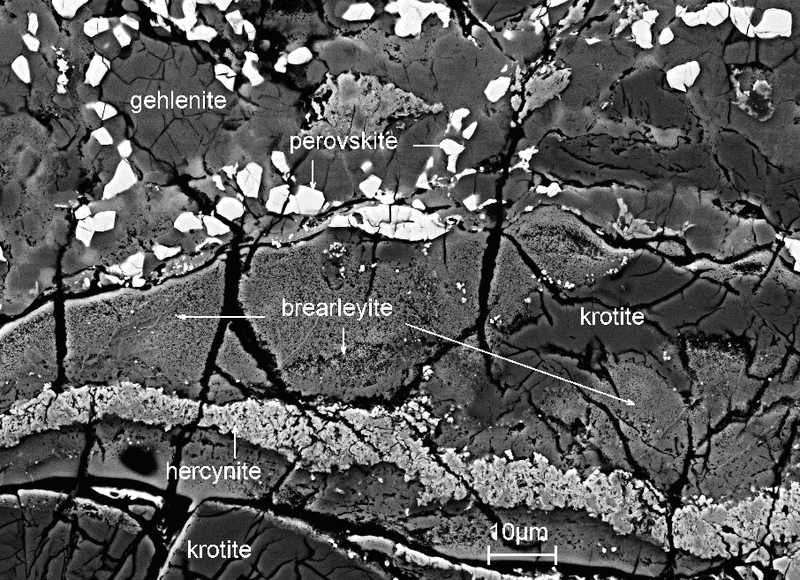 A backscattered electron image showing brearleyite with hercynite, perovskite and gehlenite in the krotite host in two areas near the CAI center.